Welcome back to First Time Classics! 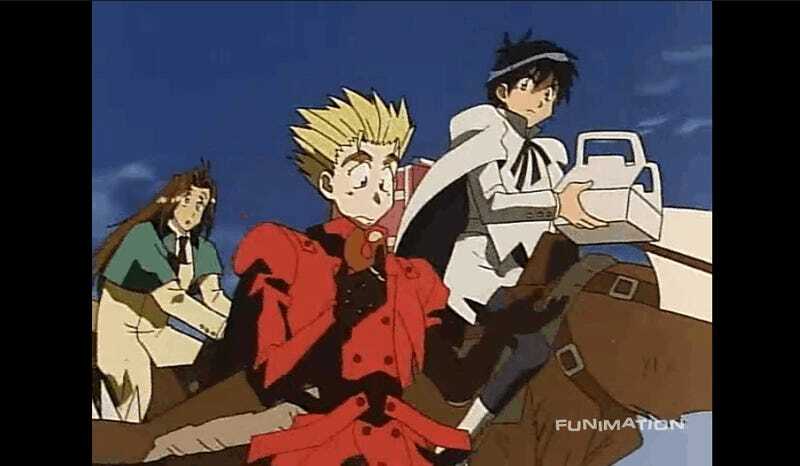 Where my adventure into anime’s past has found me in the desert wasteland of studio Madhouse’s 1998 Trigun. Time to see if there’s any bounties here to find, or if its reputation was built with loose change. First Time Classics, is an Impressions Series (not a review). Throughout my first viewing I will periodically write my impressions, with this article serving as a cumulative collection of my impressions, as well as a documentations of my ongoing and possibly changing opinions. So Trigun, well it’s not what I was expecting, at least not right off the bat. Coming into the series I was anticipating a sort of desert/space cowboy show in the vein of say Cowboy Bebop. And since i was expecting that, the first couple of episodes especially seem, well, overly comedic. Especially where Vash is concerned. It’s something that kind of threw me off at first, and I was wondering if I even would end up liking this show. Slowly though once his serious side starts coming to the fore, I found myself enjoying Vash, and the show a whole lot more, even the exaggerated comedic bits. Actually I have become kind of fond of the exaggerated comedy poses and faces this show does. It’s like an earlier precursor of Chibi-fying found in something like Fullmetal Alchemist: Brotherhood, just it only happens to the face, with only minor adjustments to the characters height. It’s getting surprisingly enjoyable now, after my first hiccups with the first episodes but I hope it keeps up with the more serious tone that these last few episodes have started showing us. 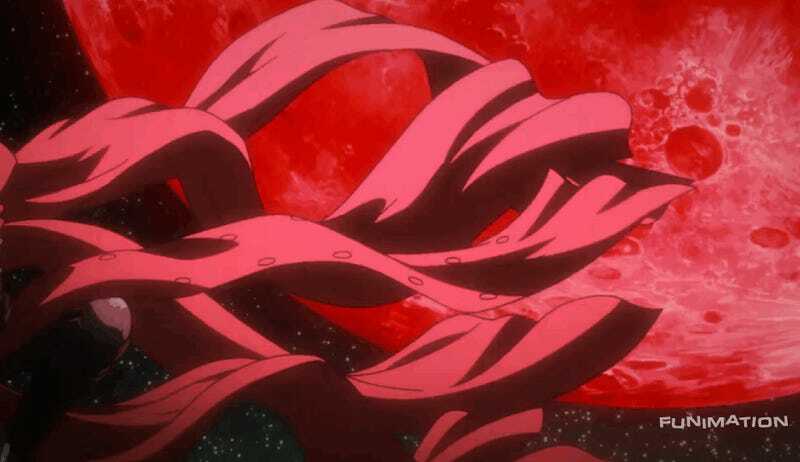 The dramatic turn in episode 6 with Vash’s reveal of his amnesia and the destruction of July was great. I hope to see more of this. Damn! When I said I was liking Trigun heading for more serious territory I was not expecting this! Episode 12 just Went DARK, like add-some-blood-and-call-it-Hellsing dark. But still, awesome episode! Anyways beyond that, I see we’ve started to get into more interconnected adventures now. And with that, the world building is really coming out, the hints to the old technology, the robotic limbs and the nature of these desert towns are kind of coming up, I hope there is some good explanations later, especially for the question about the origin of the ancient tech, what it’s for, and stuff. I can guess at some of it, but it would be nice if the anime covers it before the end. Im also really starting to dig this show more, not just for the tonal shift to more serious matter, (for one i think and kind of hope they go back to more comedic stuff after ep 12, bringing the darkness back for the finale. That’s my guess anyway.) But also I think I’m getting used to its older stylings, mostly the detailed-but-noticeably-stiff animation, and the dubs wispiness (a trait I’ve noticed other older series having). However, it may just be me becoming acclimatised to the series, but I’m starting to forget about those issues, or even enjoying them more. On to some of the new additions to the cast. I’ll start with the bad guy of episodes 7 & 8, the neon gang boss. He felt like a Jojos character to me, in that he was buff over-the-top and hilariously over-dramatic. I kind of hope he comes back, cause he was fun. And then there’s Wolfwood who’s a great addition. Another one of them BA gun-toting priests, that Japan seems to love so much. His serious take on existence, and his much more grey moral stance seems like a fruitful ground to explore, especially compared to the pacifist outlaw Vash. Hope he’s not gone for long. After the incredible Darkness of episode 12, we got a little bit of a breather I guess. Episode 13, was of course a recap episode, which I really don’t find that engaging really ever, however the rest of the episodes keep up the excitement. Episode 14 was nice, as the focus on Meryl and Milly was a nice way to get a bit more comedy, while allowing for Vash’s increasingly dark arc to continue more or less unhindered, while still giving a break from the dread and creepiness. And boy is it creepy, because Legato and his band of wackos, certainly know how to be disturbing, as well as giving some real inventive and surprising battles. The revelation of Vash’s angel arm (or whatever the hell that cannon thing was), was spectacular… horrifying and beautiful. The resulting disappearance, recovery, and (seemingly) return was a nice touch. There’s a distinct mellowness about the show now, with the comedy being a little less wacky, which I prefer, though its absence is really noticeable, having been acclimatised to it through the first half of the show. Though it really hits home of the seriousness to come. That flashback episode however… well we got to the “space” part of space-cowboy I guess. That spaceship’s crew seemed destined to get into trouble, though Knives plan to go all Ultron on everyone didn’t help not bringing out the worst of those people. It was nice to see something of their backstory… and I really hope some of the rest in between the ship and the July incident gets filled in. So that’s it then… the ending to the original Trigun anime series. Well, I will give good marks for actually making a “The adventure continues” ending that didn’t feel empty or unmeaningful. That finale felt like a perfect Trigun ending, intense, hard-fought, and hopeful; just like Vash. Not that the finale was perfect. Knives especially i found to be a good villain, if a bit one note to be honest. Legato I actually found much more interesting as a villain, having a bit more nuance in his thinking, and in terms of rival brothers, Vicious in Cowboy Bebop sorely has Knives beat as a character in my opinion. Speaking of Legato, the handling of his death, as well as that of Wolfwood in this last quarter was masterful, especially when coupled with Vash’s reaction and his subsequent character growth. This latter half of the show especially sold me this show as a great character piece, Because even though the show felt like it was paced a bit slow at times, the it was the people and their continued growth together that made this show worth it. I mean the banter and camaraderie between Vash, Wolfwood, Meryl and Mellie was great through the entire show, and only got better over time. Thanks for reading, Please comment below on your thoughts on Trigun. Do you Love it? Hate it? And if you have suggestions of what you want to see from this series, feel free to comment below.